‘Money Monster’ is a slick financial thriller with excellent performances from a starry cast, but it’s always caught between two kind of films and it never really knows which way it wants to go. The film takes place primarily on the set of a wacky and gimmicky financial show on cable TV, where an over the top presenter Lee Gates (George Clooney) discusses and recommends stocks and shares in a fashion more befitting of children’s TV. His performance is interrupted by the arrival of an irate young man with a gun and a bomb strapped to a waistcoat, who demands answers after investing 60k in a failing stock endorsed by Lee on the show a few weeks earlier. The young man, Kyle Budwell, is played by Jack O’Connell, ever so impressive in the likes of ‘’71’ and ‘Starred Up’, but his performance as a Queens native doesn’t really click here. The film undoubtedly has a strong and timely message about unscrupulous financial organisations and CEOs playing roulette with investors money, but the delivery is muddled. ‘Money Monster’ sets itself up as a flashy satire with the eye catching, wacky stocks and shares TV show, with the exaggerated presenter, but it lacks the bite when it gets into the detail. It undoubtedly works better when it taps into the pulpy thriller aspects of its story, and less so when it attempts to provide serious financial commentary. The motives are sincere but the narrative lacks the credibility to make an earnest effort at bridging the gap between the genres. Fortunately ‘Money Monster’ has a very good cast and it is undoubtedly entertaining, particularly when it fully embraces the possibilities of the hostage set up. Clooney and Julia Roberts, who plays the show’s director, are both seasoned performers and they inject a bit of impetus into otherwise one dimensional characters, and Dominic West is superbly cast as a sleazy CEO who we don’t see as much off as we should. The rest of the supporting cast is strong, but it does mostly waste some good actors, particularly Giancarlo Esposito as the lead cop at the scene with very little today. Jodie Foster’s direction is good throughout, although she struggles to really generate any tension until the final stages which is disappointing for a hostage thriller, but I did like the film a lot more when it moved out of the studio and introduced a few twists and turns. It does struggle to merge the serious point the film is trying to make with the way the narrative plays out, despite attempts to do this through Lee Gates, the man we spend the most time with, although I think Foster overestimates the goodwill we have for the character. Clooney does his best to sell it but it is difficult to buy his character’s transformation given he is set up as every bit of a shark as the CEOs he lauds on his TV show, and one encounter with Kyle seems unlikely to force a 180 turn in his mindset. 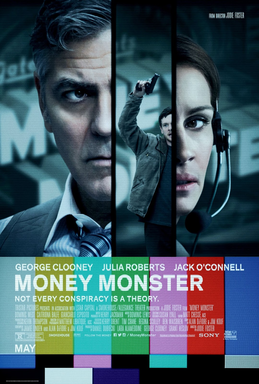 ‘Money Monster’ is an enjoyable thriller with a strong message, but it does often get caught up in its own story and the strong performances aren’t enough to fully overcome that.